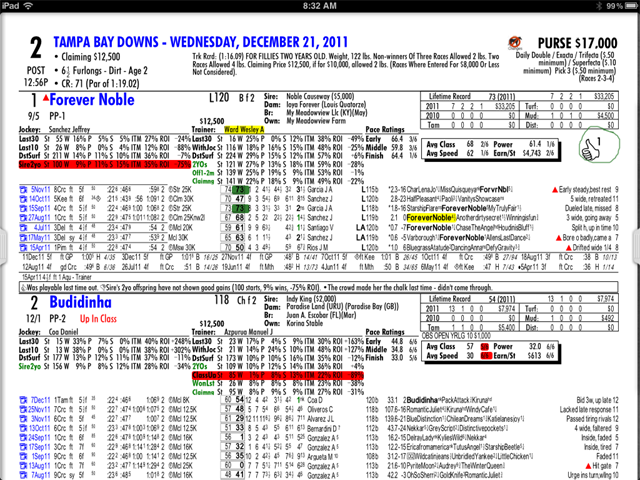 iPPs By Equibase is the ultimate iPad app. 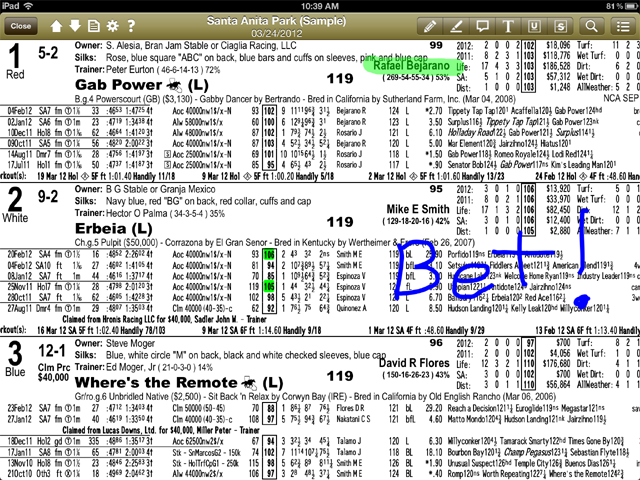 In conjunction with our parent company we have developed a revolutionary new handicapping tool for your iPad that allows you to customize and “mark-up” past performance race programs as if you were using a traditional pen and paper to handicap. The standard daily past performance available on your iPad. 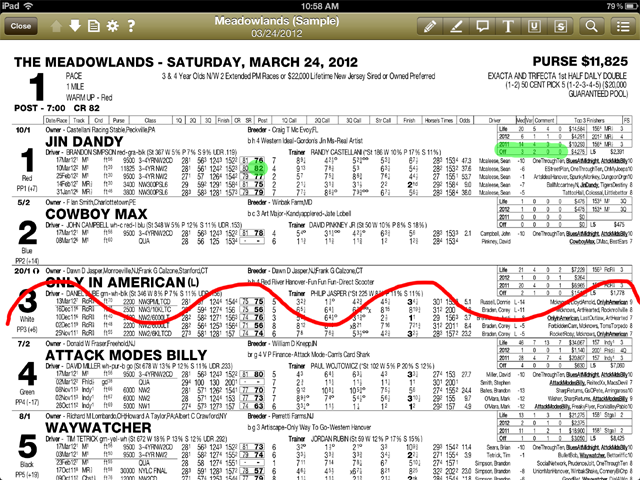 The basic PPs offer past performance data in a traditional, easy-to-read format for newcomers and seasoned track-goers alike and include Equibase® Speed Figures and Class Ratings. Going above and beyond the traditional PPs, these platinum PPs also include power ratings, pace figures, conditional jockey & trainer stats, commentary, 12 running lines, track bias information and much, much, more. The industry leader in harness programs, TrackMaster provides both of these products that, in addition to standard program information, contain exclusive speed and class ratings, post position stats, driver and trainer stats and individual horse records. 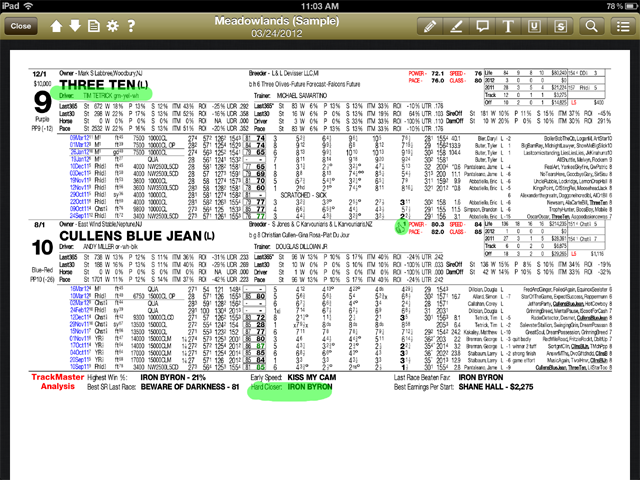 In addition to the above, these high-end reports contain power ratings, claim and trainer change details, exclusive analysis, a summary cover page and much, much, more. Once you have selected the day you want (past performances are typically available a couple days in advance of the actual race day), chose the track and type of past performance you want and it will be delivered to your iPad. 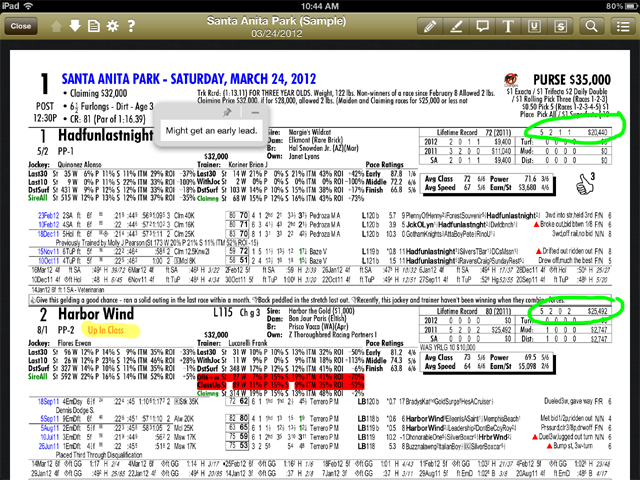 Once delivered to your iPad, you are free to mark up and personalize your programs however you like as you handicap! Denote, circle and mark your program with any of the iPPs special marking options, including a pen, highlighter, notes feature, under liner, or strikethrough functions. iPPs are not sold through the TrackMaster or Equibase web sites, you must purchase race cards through the app using your iTunes account.